Am I Still Black If? “Am I Still Black If?” is a forum focused on challenging the notion of what it means to be Black in 2015. 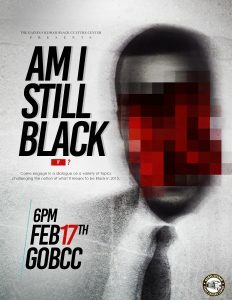 The event will take place on Tuesday, February 17th at 6:00pm in the GOBCC Large Multipurpose room. The event is sponsored by the Gaines/Oldham Black Culture Center. What: Am I Still Black If?